Ever since her freshman year of high school, Stephanie DiLoreto, BSA ’18, has been interested in Chinese culture and language. Coming to American University, she knew she wanted to study abroad in China, but after changing her specialization from International Business to Accounting, she feared she wouldn’t have the chance. However, her study abroad and academic advisors suggested DiLoreto check out the G-MEO program. Global Maximum Education Opportunities Inc. G-MEO is focused on giving U.S. students the chance to study abroad in China during spring, summer, or fall. As part of the program, students take classes, get hands-on experience in an internship, and attend cultural events around China. AU and G-MEO work together to ensure that the courses students take abroad seamlessly transfer to fulfill a semester (or summer) worth of credits. DiLoreto was especially thrilled about the available scholarship opportunities. All students who study with G-MEO receive a scholarship (those on semester programs are eligible for up to $2,400 per semester). “Knowing there were funds available for me to study abroad in Chengdu made me realize my dream of going to China could be a reality,” DiLoreto says excitedly. Once there, DiLoreto moved in to her residence hall at Sichuan University where she met other U.S. and Chinese students. “A lot of the students lived in the dorms over the summer, so we all became very close,” DiLoreto says happily. The classes were held at the Chengdu American Center for Study Abroad on the Sichuan campus. Located in downtown Chengdu, the center is accessible by metro, and DiLoreto found it easy to get to her internship or go out exploring after class. DiLoreto interned for Unilever, a multinational parent company of over 400 brands ranging from Lipton to Dove, in the Trade Marketing department. To be considered for an internship, DiLoreto simply marked an interest on her application and sent her resume to the G-MEO program director. Soon after, the staff set her up with an interview. In her position, she went on site visits, sat in on executive meetings, and learned how the department functions. 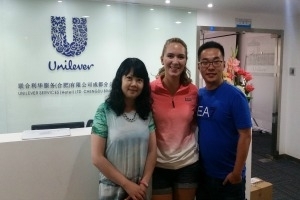 “My experience at Unilever was one of my favorite parts because of how much I learned. They taught me so many valuable skills for my future career and about Chinese culture,” DiLoreto recalls. DiLoreto’s experience wasn’t all work and no play, however. While there, she joined a rugby team, participated in a cultural Yoga Festival, went to the Panda Research Center, and visited The Southern Sea Bamboo Forest. DiLoreto says one of the most breathtaking moments in China was watching the sun set over the fog-covered bamboo hills. “We explored the forest, saw waterfalls, and climbed dozens of flights of stairs to the top of a temple,” DiLoreto describes excitedly. After graduation, DiLoreto hopes to return to China to work and live. “I learned how business is done in a different part of the world, and discovered that I really love Chinese culture,” she said. Interested in learning more about G-MEO? Please contact AU Abroad (http://auabroad.american.edu/). Kogod students are welcome to contact KSB Global Learning at KSBabroad@american.edu to learn more about the full portfolio of international programs available to Business students.